Established in 2011 in honor of IU’s first vice president for international affairs, the Patrick O’Meara Lecture series brings distinguished guests to the IU Bloomington campus to address timely international topics. David L. Carden served as the first resident U.S. ambassador to the Association of Southeast Asian Nations (ASEAN). 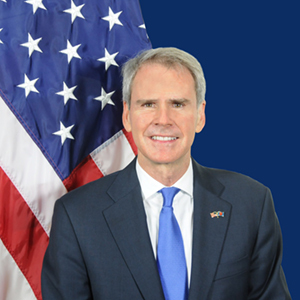 As U.S. ambassador, Carden oversaw the broadening engagement of the United States in Southeast Asia, which included the Obama administration's 2011 "pivot" or "rebalance" to the region. His responsibilities included supporting ASEAN economic integration and advocating for the systemic changes necessary to promote peaceful and prosperous growth in the region. Under his leadership, the U.S. Mission to ASEAN addressed the issues inherent in realizing ASEAN's aspirations. These included economic development, trade liberalization, intellectual property protection, developing the rule of law and more effective governance, human rights, pandemic prevention and preparedness, advancing health care and educational opportunities, terrestrial and maritime environmental protection, managing the region’s fisheries and natural resources, responding to deforestation and climate change, food and water security, and advancing programs to increase the resilience of ASEAN's people and institutions. Prior to his ambassadorship, Carden was a partner in Jones Day's New York office where he co-chaired the Securities Litigation and SEC Enforcement Practice. He has represented clients in some of the largest securities fraud class actions ever litigated, including the defense of Lehman Brothers in the Enron Litigation and Union Excess in the In Re AIG Securities Litigation. He was special litigation counsel in the Lehman Brothers Holding Bankruptcy and was responsible for coordinating the defense of litigation and conducting investigations in numerous foreign jurisdictions. Roberto Salinas-León, president of the Mexico Business Forum in Mexico City, where he works on a variety of projects of policy analysis, investment advisory, and economic consultancy, delivered the seventh annual Patrick O’Meara International Lecture on March 21, 2018, in Presidents Hall on the IU Bloomington campus. Salinas-León holds a B.A. in political economy, history, and philosophy from Hillsdale College and an M.A. and Ph.D. in philosophy from Purdue University. He has been an adjunct professor and visiting professor of political economy at the Escuela Libre de Derecho (1989–2002), Universidad Nacional Autónoma de México (1989–1992) and the Instituto Tecnológico Autónomo de México in Mexico City (since 2004). He is currently senior debate fellow and debate lecturer at Calvin Coolidge Presidential Foundation in Vermont. Salinas-León has organized a number of the most important policy and academic forums in the past 25 years in Mexico, including the annual roundtable of The Economist Group, which he directed from 1997 until 2009. He is president of Alamos Alliance, which organizes an annual economic and policy symposium in Álamos, Sonora. For 25 years, this gathering has hosted the most recognized names in economic policy in Latin America and the world, as well as some of the most distinguished minds in the field of economics. He has published more than 2,000 editorials (English and Spanish) on public policy topics, including occasional op-ed pieces in The Wall Street Journal, The Journal of Commerce, Investor’s Business Daily, Barron’s, and others. He was a weekly editorial columnist in El Economista from 1993 to 2011. He is an occasional commentator for CNN, CNN Latin America, CNBC, the BBC, and others. Salinas-León has delivered more than 900 lectures in Mexico, the United States, Canada, several countries in Central and South America, and throughout Europe and Asia. He has testified before the U.S. Congress on three occasions—on NAFTA and free trade, structural reform in Mexico, and monetary and exchange rate policy. Narendra Jadhav, an IU alumnus, economist, writer, and educator and a member of India’s parliament, addressed a large audience in Presidents Hall on November 14, 2016. After completing his doctorate in economics at IU in 1986, Jadhav worked at the Reserve Bank of India, rising to the position of chief economist. He later became vice chancellor of the University of Pune and a member of the National Planning Commission and of the National Advisory Council of India. He now serves in India’s parliament. He is broadly recognized in India for two works detailing his family’s rise out of the caste system. In total, he has published 21 books ranging from biography and poetry to political economy. In the sixth annual Patrick O’Meara International Lecture, Jadhav connected the United States’ historical treatment of African Americans with India’s caste system and explored the economic implications of a society that disenfranchises large segments of its population. Jadhav traced this progress through the work of major figures—Booker T. Washington, William Dubois, and Martin Luther King in the United States and B. R. Ambedkar and Mahatma Gandhi in India. Despite differences between the countries, these figures found inspiration in the work of each other. Tracing the pattern of economic growth in the two countries across the centuries, Jadhav compiled an impressive array of statistics that point to the economic value of inclusion. He noted that the United States faces a future of slow growth, while India’s young population offers the opportunity for double-digit growth through the availability of a growing workforce at a time when the working population of other major economic powers is shrinking. Jon Huntsman Jr., governor of Utah from 2005 to 2009 and U.S. ambassador to China from 2009 to 2011, delivered the fifth annual Patrick O’Meara International Lecture. He spoke to a standing room–only audience at the Whittenberger Auditorium on September 16, 2015. Among the global issues that need immediate attention are “a huge diffusion of power,” the “rise of individual empowerment,” and “worsening demographic trends and patterns.” Using the examples of cybercrime and ISIS, Huntsman noted that “non-state actors can drive an agenda like never before.” At the same time, “anyone today, it seems, can call for a revolution, and people will show up.” Finally, the rapid growth of cities has created problems with “hard choices”: air quality, health care, education, and infrastructure. Sir Hew Strachan, Professor of International Relations in the School of International Relations at the University of St. Andrews, and former Chichele Professor of the History of War at All Souls College, Oxford, addressed the impact of World War I in the fourth annual Patrick O’Meara International Lecture on April 15, 2015. Sir Hew is a distinguished military historian and an authority on the First World War. Sir Hew Strachan was Chichele Professor of the History of War and a fellow of All Souls College at the University of Oxford before joining the faculty at the University of St. Andrews in 2015. He was director of the Oxford Programme on the Changing Character of War between 2003 and 2012. He serves on the Strategic Advisory Panel of the Chief of the Defence Staff and on the U.K. Defence Academy Advisory Board. He is a trustee of the Imperial War Museum, a commonwealth war graves commissioner, and a member of both the National Committee for the Centenary of the First World War and the Council of the International Institute for Strategic Studies. He is a fellow of Corpus Christi College, Cambridge; was elected a fellow of the Royal Society of Edinburgh in 2003; and was awarded an Hon. D. Univ. by the University of Paisley in 2005. In 2010, he chaired a task force on the implementation of the Armed Forces Covenant for the prime minister. He was the inaugural Humanitas Visiting Professor in War Studies at the University of Cambridge in 2011 and was appointed specialist adviser to the Joint Committee on the National Security Strategy. Sir Strachan is a brigadier in the Queen’s Bodyguard for Scotland (Royal Company of Archers). In December 2012, Foreign Policy magazine included him in its list of top global thinkers. He was knighted in the 2013 New Year’s Honours and was appointed lord lieutenant of Tweeddale in 2014. The lecture is part of IU’s World War I commemoration. Lee A. Feinstein, founding dean of the School of Global and International Studies at Indiana University, presented the third annual Patrick O’Meara International Lecture on April 1, 2014, at IU Bloomington. A U.S. ambassador to the Republic of Poland from 2009 to 2012, Feinstein has had a distinguished career in and out of government. A noted scholar-practitioner, Feinstein has served two secretaries of state and a secretary of defense and has worked at the nation’s top research institutes, including the Council on Foreign Relations and the Brookings Institution. Richard G. Lugar, a former U.S. senator from Indiana, presented the second annual Patrick O’Meara International Lecture on February 18, 2013. Lugar is a fifth-generation Hoosier who has been a gifted local and state leader and a respected national and international statesman, exercising leadership on critical issues such as food security, nuclear non-proliferation, energy independence, and free trade. He holds honorary degrees from colleges and universities in 15 states and the District of Columbia, and was the fourth person to be named Outstanding Legislator by the American Political Science Association. Lugar graduated first in his class at both Shortridge High School in Indianapolis and Denison University in Granville, Ohio. He attended Pembroke College at Oxford University as a Rhodes Scholar, studying politics, philosophy, and economics. Lugar volunteered for the U.S. Navy in 1957, ultimately serving as an intelligence briefer for Admiral Arleigh Burke, Chief of Naval Operations. As two-term mayor of Indianapolis (1968–75), he envisioned the unification of the city and surrounding Marion County into one government. Unigov, as Lugar’s plan was called, set the city on a path of uninterrupted economic growth. He served three terms on the U.S. Advisory Commission on Intergovernmental Relations, including two terms as the vice chair of the commission, and served as president of the National League of Cities. Lugar has been a leader in reducing the threat of nuclear, chemical, and biological weapons. In 1991, he forged a bipartisan partnership with then-Senate Armed Services Chairman Sam Nunn, D-Ga., to destroy these weapons of mass destruction in the former Soviet Union. To date, the Nunn-Lugar program has deactivated more than 7,500 nuclear warheads that were once aimed at the United States. As chairman of the Agriculture Committee, Lugar built bipartisan support for 1996 federal farm program reforms, ending 1930s-era federal production controls. He has promoted broader risk management options for farmers, research advancements, increased export opportunities, and higher net farm income. Lugar initiated a biofuels research program to help decrease U.S. dependency on foreign oil. He also led initiatives to streamline the U.S. Department of Agriculture, reform the food stamp program, and preserve the federal school lunch program. Timothy J. Roemer, a former representative from Indiana and former U.S. ambassador to India, delivered the inaugural Patrick O’Meara International Lecture on November 9, 2011. Timothy Roemer served from 2009–11 as U.S. Ambassador to the Republic of India. During his tenure, India became the 12th leading trade partner of the United States. Roemer and Indian Home Affairs Secretary G.K. Pillai signed the Counterterrorism Cooperation Initiative, which expands cooperation in various security areas. Roemer represented northern Indiana’s third district in Congress from 1991 to 2003. He was a key sponsor of legislation to establish the National Commission on Terrorist Attacks Upon the United States, known as the 9/11 Commission, and served as one of its 10 members. After leaving Congress, Roemer was president of the Center for National Policy and served on the Commission on the Prevention of Weapons of Mass Destruction Proliferation and Terrorism, the Washington Institute for Near East Policy’s Presidential Task Force on Combating the Ideology of Radical Extremism, and the National Parks Second Century Commission. He is on the board of the Adams Memorial Foundation. 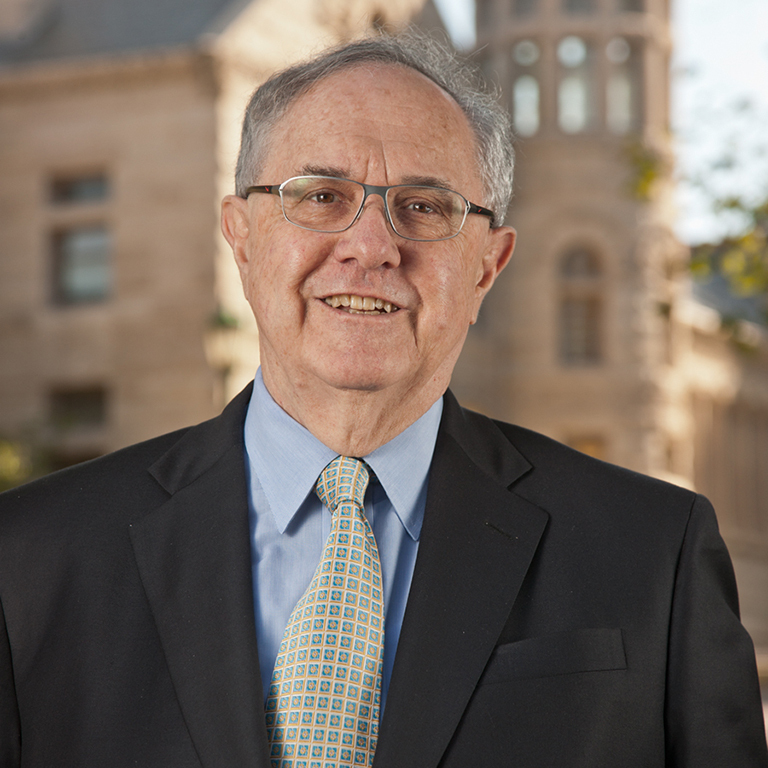 Patrick O’Meara served as IU’s ambassador to the world for more than four decades. A political scientist, he directed IU’s African Studies Program, was dean of international programs, and was IU’s first vice president for international affairs. When you support the Patrick O’Meara Lecture Series, you’re helping to ensure IU’s place as a leader in global engagement.